To gain a better understanding of how Cruise hopes to one day offer driverless cars you can hail with a phone app, we dive deep into its technology and testing. The company has just launched a beta of a driverless ride-hailing service its employees in San Francisco can use. According to Cruise, the employees can hail its fleet of over 100 driverless cars with a smart phone app practically whenever they want for trips within the city limits. The company's technology and testing strategy largely draw from the talents of co-founder and CEO Kyle Vogt, an MIT graduate who is famous for selling two money-losing startups for $1 billion each before turning 31. For the day-to-day operations and long-term planning, Cruise relies on co-founder Daniel Kan's business acumen as the company's chief operating officer. Cruise said earlier this year it will staff up to more than 1,100 over the next five years and invest $14 million in a new San Francisco-based R&D center. Cruise's size will then roughly match that of GM's R&D headquarters in Warren, Mich.
GM is making 130 Chevrolet Bolt EV driverless test vehicles at its Orion Township, Mich. plant to grow Cruise's fleet to 180 — deployed in trials in San Francisco; Scottsdale, Arizona; and Warren, MI. GM also claimed to be the first company assembling self-driving vehicles in a "mass-production facility" when it started making driverless Chevrolet Bolt EVs in January. GM has also pledged to allow Cruise to keep its startup culture while giving it everything it needs to test its driverless fleets from its billion dollar-plus R&D budget. 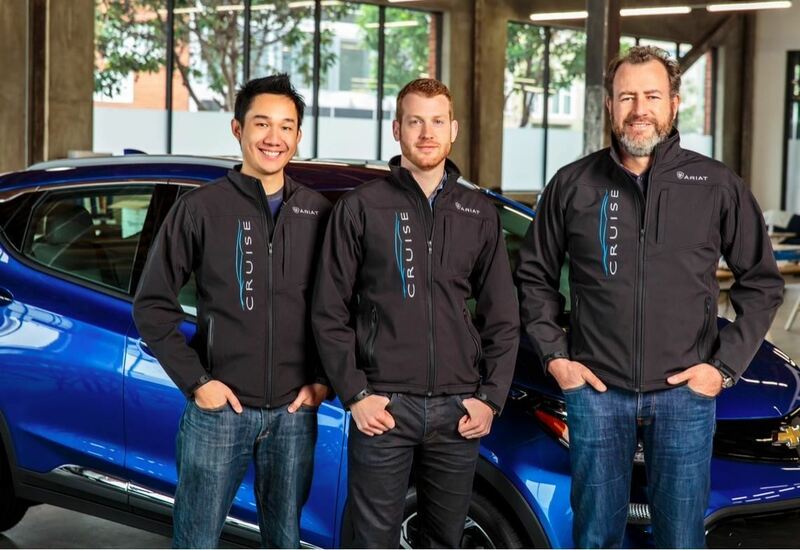 We've detailed below how Cruise is testing its driverless-enabled Chevrolet Bolts, and a limited number of Nissan Leafs and other models, for launch as an app-based driverless ride-hailing service. Cruise has not disclosed when it hopes to launch its driverless fleet. According to IHS Automotive data, commercial driverless ride-hailing services from Cruise or other companies such as Argo, Lyft, Uber, and Waymo could become available as early as 2021. What Is Cruise Automation's Overall Testing Strategy? Cruise is testing a broad range of self-drive technologies embedded in its driverless fleets in and around San Francisco, Warren, and Scottsdale, industry sources told Driverless. These three cities are in proximity to local universities (which serve as a source of engineering talent) and collectively represent different climate and driving conditions in the US. Cruise is making sure its driverless systems are working properly in every weather condition: from Scottsdale's searing summer heat to the relatively extreme cold conditions in Warren. San Francisco is a particularly difficult test environment because of its busy streets, hills, and trolley traffic. A recent job opening at Cruise seeking "automated vehicle trainers" in Warren reveals that Cruise's fleet technicians monitor its fleet's driving performance and monitor and log software data. Road conditions, self-driving system behavior, and other information is gathered from these cars, analyzed, and redistributed back to the cars, which then use the information to improve their driving. Another job ad, from earlier this year, tells us that they're likely also developing and testing 3D maps to help guide the cars. These maps play a critical role in the self-drive process, by offering detailed information about signages, road conditions, and other information that feeds into the neural network computer in the car that compares the visual data it registers with the maps in real time. The ad, for a lead engineer to head Cruise's development efforts of 3D maps, says Cruise will "eventually scale mapping to 100+ cities." Cruise has been very secretive about the hardware it is testing and what it plans to use when the service launches commercially. Cruise's Bolts have been seen with expensive LiDAR rotating mirror devices as seen in this video, like those supplied by Ford subsidiary Velodyne. Other than what we can see in the images and videos posted, Cruise had not revealed which specific LiDAR, camera, radar, and other hardware its cars use, or will use in the future. A source from Mobileye did tell Driverless that Cruise's test cars do not have Mobileye cameras or Intel CPUs in its driverless platforms, so it must be using components from other suppliers or making its own in-house. All of this could change, though, especially if Cruise decides it wants to sell its Level 4 cars to the masses. It will be a few years before laws are in place that even allow carmakers sell autonomous cars in retail channels, but when they do, it could switch to a more-affordable solid-state LiDAR for retail vehicles. For now, Cruise will likely stick with the more expensive technology for their limited fleet of cars for testing and ride-hailing. One the other main component of driverless cars is also the most difficult: The neural network. The cars' neural networks are what power the super human like-thinking and decision-making capabilities needed for self-driving. Vogt, drawing from his R&D experience, is probably playing a key role in the development of a self-developed neural network, instead of relying on a third party such as Nvidia (which has not announced that Cruise is one of its customers). Interestingly, for all the hype Cruise has gotten, its test vehicles only clocked a bit more than 9,776 driverless miles last year in California. Waymo has the widest lead in the number of miles its vehicles have traveled in self-drive mode, totaling 635,868 miles in 2016 in the state, according to California's autonomous vehicle disengagement reports. BMW, Nissan, and Ford also logged significantly more driverless miles than Cruise did last year. How Does Cruise Communicate What It's Up To? Cruise puts out few media releases about its driverless program, aside from the occasional Tweet or video. Vogt summed up his fly-under-the radar publicity style in a live interview on Youtube with TechCrunch, alluding to some unnamed companies known for making driverless-related marketing announcements full of hype but with little actual value. We don't talk about driverless miles as much because what we try to do is to throw our vehicles in the most challenging urban driving scenarios. Downtown San Francisco is an example of that. We sort of accelerate that feedback cycle. If we see something that the car doesn't handle well, we take it back to the lab, work on it, and try it again. 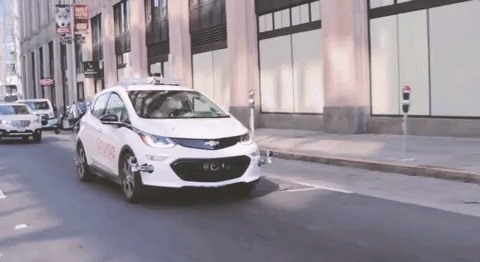 In a recent video about the Cruise Anywhere beta program, employees are shown hailing Cruise's Chevrolet Bolt driverless fleet in San Francisco with an app. 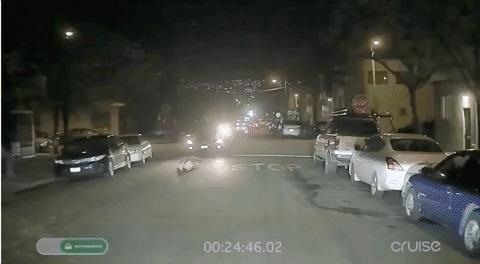 In another video, posted posted April 19, 2017, Cruise shows off its self-driving car navigating 20 minutes and 45 seconds at night in downtown San Francisco with no input from the driver. 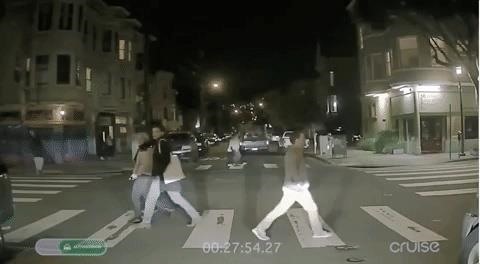 The self-drive car is seen making several stops at traffic lights and stops, stopping to let pedestrians cross the street, slowing down to allow a pickup truck driver make an illegal u-turn, and safely slowing down to avoid hitting a raccoon at one point. The driver never took the wheel of the car, throughout the 20-minutes and 45-second drive. Cruise showed off a self-driving car successfully piloting itself around some often-complex driving scenarios in downtown San Francisco in a video posted Jan 19, 2017. In the SF drive, the Cruise car successfully navigates through some of the most difficult urban driving conditions we've seen with no input from the driver. In the video, the car performs some impressive feats, including driving around a poorly marked construction site in the middle of the lane, and trying to pass a stopped bus, then deciding not to after the bus starts moving again. 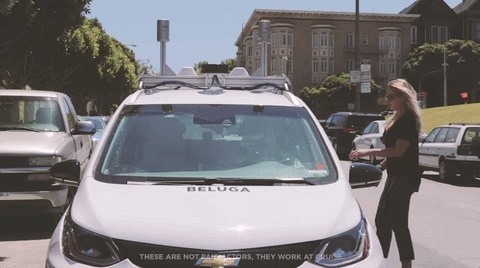 The car can even successfully navigate SF's notorious cyclists. It comes up behind a stopped car, then waits as a cyclist pedals past, before passing on the right. 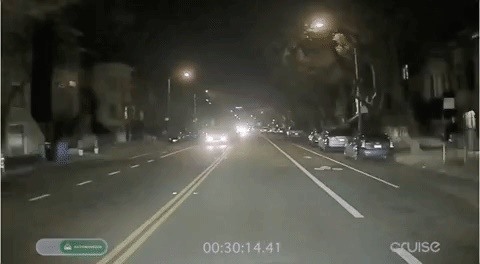 At one point, the car slows down to let what appears to be a pigeon cross the street. Vogt is the type of person who once pulled an all-nighter with two lead engineers to code an Audi S4 to brake and steer itself, finishing with just minutes to spare before a presentation that secured him (and Cruise) $4.3 million in venture capital seed money. On the other hand, GM is a conservative auto giant from the notoriously conservative car industry. The relationship seems to work, in part, since GM practically gives Vogt carte blanche to develop Cruise's fleet as he sees fit, while GM maintains a very hands-off approach towards its subsidiary. That hands-off approach means Vogt the engineer has free rein to run his company as an engineering and results-driven startup. This culture is apparent in Vogt's dismissal of traditional marketing campaigns. Cruise's ultimate mission is to develop an app-based driverless car ride-hailing business, and the only way you're going to get that is by building it, no matter how much hype you create. It looks like the company it is well on its way, depending on the success of its new beta program. Hopefully, we'll see more videos of Cruise's driverless cars in other cities soon, or legislation permitting, maybe we'll even see a full-fledged Uber competitor in just a few years.